The following lesson plan can be used by Spanish teachers to introduce the imperative mood to English-speaking Spanish students. The first part introduces the imperative to students by explaining the use of the verb form in English. The second part describes how to form the imperative in Spanish and includes charts for each verb type and useful tips. Use as much or little of this section for your students as you think the class needs. It is material they should know, but they may not have paid attention to the material in their English grammar studies. Do not tease the cat. Do not forget to site your sources. Don’t eat cookies in bed. The grammatical subject of imperative sentences in English is always the second person personal pronoun you, either singular or plural. Unlike declarative and interrogative sentences in English that must contain a stated grammatical subject, English imperatives usually contain an understood you. An understood you is defined as a you that functions as the subject of an imperative sentence but is not implicitly stated. Or, the pronoun you is understood to be the subject of the sentence. You take a shower right now. Please buy me a soda. Lava por favor los platos. "Wash the dishes please." ¡Bebed la leche! "Drink the milk!" Visite la biblioteca. "Visit the library." Escuchen el professor. "Listen to the teacher." Explain the general rules for forming the imperative in Spanish. 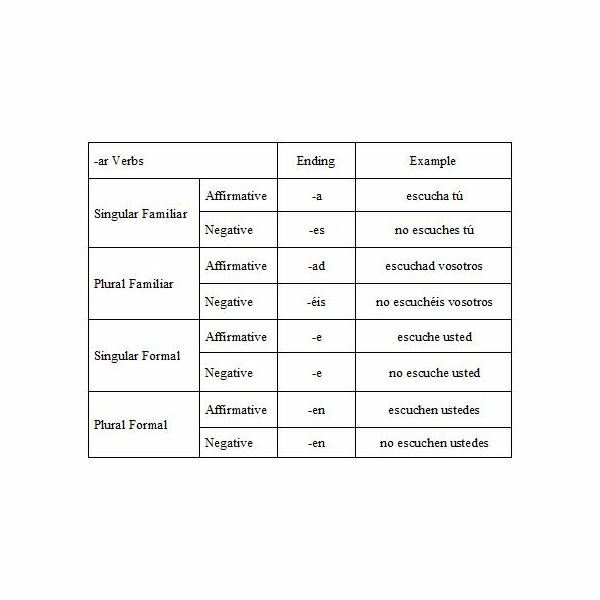 Four different forms exist for the familiar tú and vosotros commands: singular affirmative, singular negative, plural affirmative, and plural negative. All of the familiar commands are formed by first removing the infinitive ending (-ar, -er, -ir) from the verb and then adding the appropriate imperative ending. Two different forms exist for the formal usted and ustedes commands: singular and plural. All of the formal commands are formed by conjugating the verb into the first person singular present indicative form, removing the -o ending, and then adding the appropriate imperative ending. Explain the difference in use between the familiar and formal forms of the imperative mood in Spanish. The second person pronouns tú and vosotros, which are both you in English, are familiar forms. Familiar forms should be used only with family members, close friends, children, peers, and animals. For example, habla "speak" can be said to a student by a teacher or to a child by a parent. The second person pronouns usted and ustedes, which are both are also you in English, are formal forms. Formal forms are always used with strangers, casual acquaintances, superiors, professional colleagues, people with formal titles, and others not well know to the speaker. For example, beba "drink" can be said to a supervisor by an employee or to a parent by a child. Explain the use and position of subject pronouns with the Spanish imperative. The grammatical subject of imperative sentences in Spanish is also always one of the four the second person personal pronoun: tú, vosotros, usted, and ustedes. Similar to the optionality of the understood you in the English imperative, the subject pronoun is also optional in the Spanish imperative.